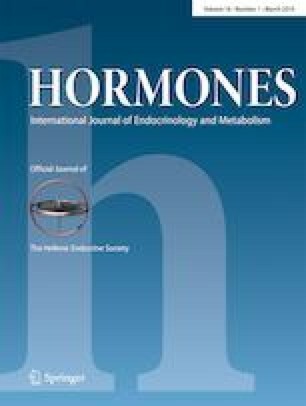 Isolated gonadotropin-releasing hormone (GnRH) deficiency (IGD) is a rare Mendelian disorder characterized by genetic and phenotypic heterogeneity. Apart from failure of sexual maturation and pubertal development (i.e., the normosmic form of idiopathic hypogonadotropic hypogonadism (nIHH) or the anosmic form of Kallmann syndrome (KS)), the disorder is also characterized by various non-reproductive features, including unilateral renal agenesis (URA). Interestingly, family members of affected patients usually display milder forms of IGD or its non-reproductive features, such as isolated anosmia and URA, highlighting the variable expressivity of the disorder [1, 2]. We would like to thank Dr. William F. Crowley for his contribution in the genotyping of the patient in the Reproductive Endocrine Unit of Massachusetts General Hospital and for his valuable and constant mentorship. MIS conceived part of the study, participated in its design and coordination, participated in the molecular genetics studies, and drafted the manuscript; PL participated in coordination of the project, carried out the molecular genetic studies, and participated in the sequence alignment; AGT examined the patients, performed all hormonal and imaging tests and made the final diagnosis, referred the patient for genetic testing, and obtained informed consent; DS examined the patients, performed all hormonal and imaging tests and made the final diagnosis, referred the patient for genetic testing, and obtained informed consent; KV participated in coordination of the project and carried out part of the molecular genetic studies; GAN conceived the study, participated in its design and coordination, and helped to draft the manuscript. All authors read and approved the final manuscript. Dr. Maria I. Stamou would like to thank the Alexander S. Onassis Foundation for the support of her research training. This work was supported by the Eunice Kennedy Shriver National Institute of Child Health and Development (NICHD), Harvard Reproductive Sciences Center (P50 HD028138).